Today we have two remarkable stories of healings by Jesus, one story told within the other. In both cases, the individuals involved have come to Jesus out of their desperate need along with faith in his power to help them. Jesus has just returned from the country of the Gerasenes and is teaching a crowd in Capernaum. 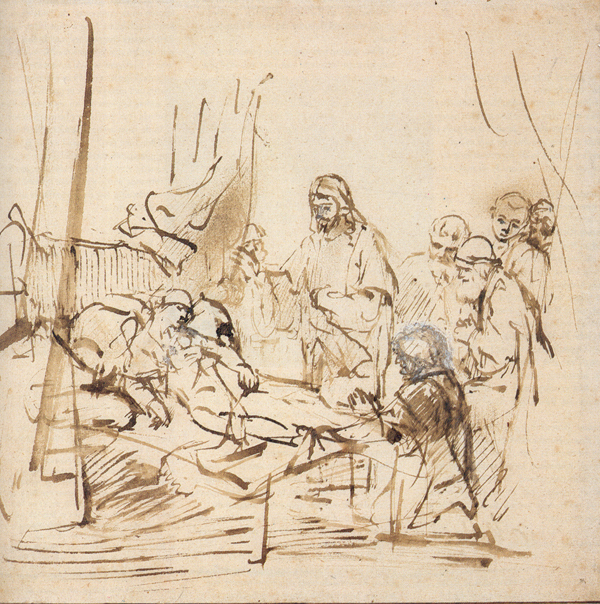 Jairus, described as one of the leaders in the synagogue, comes to him and falls at his feet in a gesture of respect. He tells Jesus that his daughter is at the point of death. In verse 23 we hear of his faith in knowing that if Jesus only lays hands on her, she will be made well. So Jesus heads out, with the large crowd following him. Within the crowd is a woman who has suffered from a hemorrhage for twelve years. She finds her way to Jesus, and reaching from behind, touches his cloak, believing that a simple touch will relieve her of her disease. Immediately she is healed, but Jesus feels his power leave him at the same moment and stops to ask, “Who has touched me?” Imagine the scene – would you come forward and admit this? In fear and trembling, she steps forward; instead of reprimanding her, Jesus commends her faith and tells her to go in peace. In both stories we hear Jesus’ compassion. He takes the time to minister to this woman in a crowd as well as leave whatever he has been doing (teaching probably) to attend to Jairus’ pressing situation. “Do not fear, only believe” (vs. 36). Last week’s Gospel as well as this week’s reminds us to keep our faith in Jesus. Whether we are in need of healing or solace in an anxious moment, we can be at peace when we put our faith in Jesus. It does not mean ignoring the situation, but it does mean we need to reach out in faith to the one who heals, comforts and brings us peace. All we need do is ask. Grace is surely amazing in its single-minded desire to heal and restore. There are no anonymous experiences with God. Grace is always a personal encounter. Let it be so for all of us. As your read the story of the healing of Jairus’ daughter, imagine that you are Jairus. How do you think might have been changed by these events? Compare the account of the woman with a hemorrhage with the story regarding Jairus. What similarities and differences do you notice? What do we learn about the connection between faith and healing? What do these stories teach you about prayer? About faith? About grace? List the different ways that contemporary society offers freedom from suffering. Name the ways you have spent your strength and your abundance (connect to Paul’s letter in today’s Epistle to the Corinthians) but have not been made whole or free. How can we touch Jesus’ garment today? In what ways does the desire to get something special from God motivate your spiritual life (prayer habits, devotional reading, liturgical involvement or standard of ethics)? This entry was posted in Ordinary Time and tagged Gospel of Mark, healing, Jairus' daughter, Jesus, Lectionary. Bookmark the permalink.